BTW, is that an upcoming thing or something that is already in 1.0? II feel a kind of shame when I read the stuff I write here and there.. UGH! ARGH! Houston we have a problem. Exact pixels aren't ideal. 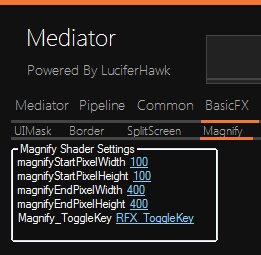 When using it on a different resolution, you have to redo the numbers to fit that resolution. Therefore I ask can you do it percentage wise Ganossa so that it stays the same no matter what the resolution is? I believe the original purpose of the shader was to deal with specific resolution problems. For those, the problem changes with a different resolution, also for percentage values, while pixels are the less concealed values that can be easly read from e.g. a screenshot. For what purpose are you using the shader, so I can get an idea in which way I could improve it? Its called magnify, so yeah, to e.g. actually support the purpose in its literal interpretation I would indeed need to add percentage to be resolution independent but also a variable for the center point which does not exist yet. I'm using the shader to get rid of the black bars in the games that have them. Also, perhaps you can rename and recode the options for it to say left, right, top, and bottom so it will be easier to read. With positive values that mean outward and negative values that mean inward. So if I want to bring the right side of the screen in, i'd say Right, -100. And if I wanted to push it out, I'd say Right, 100. The value of 0 would mean untouched. Last Edit: 3 years 4 months ago by Sh1nRa358. I don't know if existing Ambient Lighting could be adapted, but from my, far from development, point of view it needs to detect black color from top/bottom with same width as horizontal resolution and left/right with same height as vertical resolution. And most simplified algorithm of Ambient Light as it should be blurred with no details(and less impact is better of course), only dominant colors to apply only to those detected black areas. Looks like blurred image applied where usual black bars are. Ambient light has a blurring afaik but a simple gaussian blur on the image should do the job as well. Was thinking about Gaussian Blur, but not sure it's enough to suggest it instead. In SVP it have "Light sources count" (1-32), "Average depth" width of frame's edge to use as source (2-300px), "Flare length" (10-500%) to determine how fast light sources fade to black and "Light source size" (10-400%) options for effect. There's also options to have it without black borders too as some people likes it that way. If I'm guessing right it works this way: 1) detect if vertical or horizontal bars present; 2) using "average depth" value to chose line for sampling for each bar; 3) splitting line by "light sources count" value into segments; 4) determining average color for each segment; 5) generating light sources with those colors with height and width of each limited by "flare length" and "light source size" accordingly. If anybody is interested - would be nice to have such shader. IMO it's much better to add a bit of eye-pleasing content than to have wrong proportions or miss part of screen. Rather rude wouldn't you say. If you wanted to you could add images to the left and right. But this thread is called stretch shader. Not everyone shares your views and old heads have been playing this way waaay before ps3 era came so alot of ppl don't see a problem with stretching. This isn't the place to debate about it either. Sorry if I offended you in any way, hijacking topic wasn't intentional. Just shared of better, by my opinion, solution of whole black bars problem and detailed it later. To each their own. If it's inappropriate or simply would be better to move what I said to separate topic may moderator be kind enough to move it there, naming it "filling black bars" or any other way as all variations of filling would be welcomed, not only ambilight. Thanks. Do the settings carry over when switching resolutions now with 2.0? There was (unfortunately?) no change on that shader from 1.1 to 2.0 as far as I remember. Hey, can you put an extra option to identify 2 separate portions of the screen so that you could stretch each section individually? This would help the game cover the full area of the screen in splitscreen coop games that leave black bars on the side like Resident Evil 5 and RE Revelations 2.